The village of Samoëns is in the department of Haute-Savoie; high in the French Alps. It’s only 14km from the Swiss border. A place of outstanding natural beauty, the long arc of Lake Geneva is to the north while, to the south, numerous other ski resort towns are to be found. 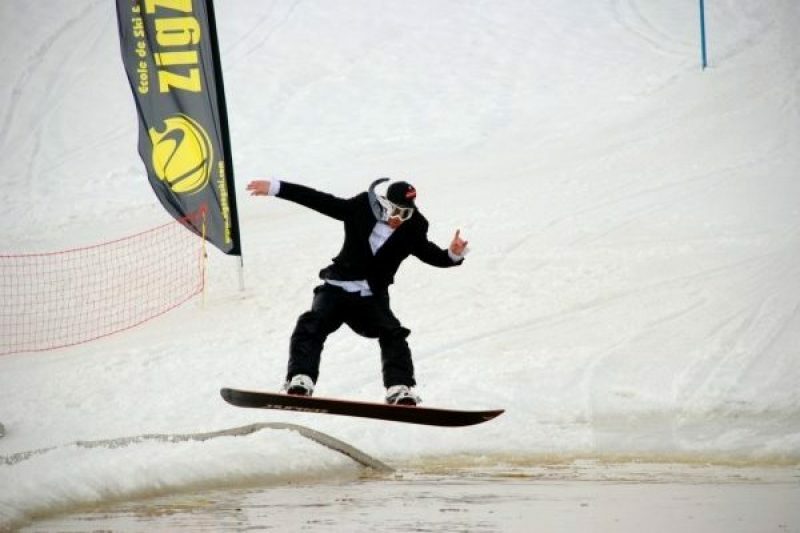 Among them are some of the most well-known, such as Chamonix, Megève, Les Arcs and Courmayeur; the latter over the Italian border. 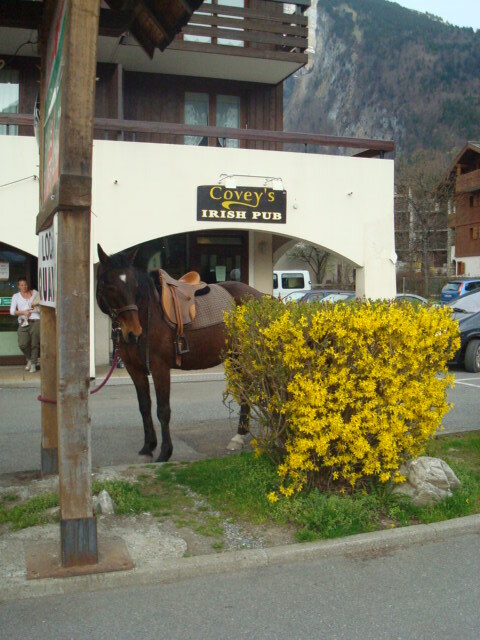 Covey’s Irish Pub stands in the middle of Samoëns and it has just come to the end of another successful season catering for the growing number of discerning tourists that find themselves in this splendid corner of France, surrounded by majestic mountains, two national frontiers and thousands of hectares of national park. 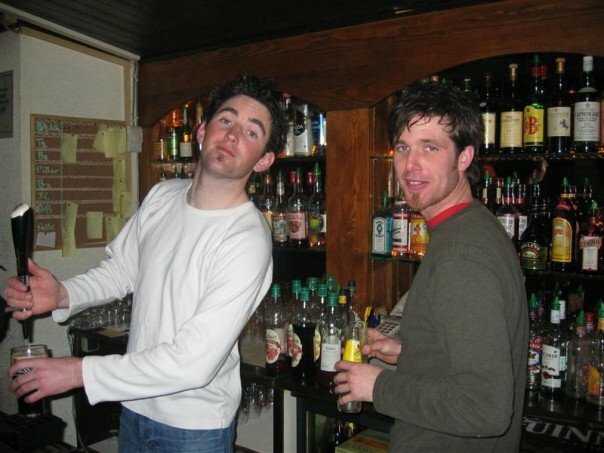 The owners of Covey’s are Shane Cunningham and John Heraghty. Both men are in their mid-thirties and hail from Westport in Co Mayo. It was through a Donegal man named Rob McCarthy that they got an early introduction to the Alpine side of the country. If both men had already been bitten by the French bug, they were really hooked once they had worked on their first winter season in the snowy Alps. For someone coming from Ireland and seeing it for the first time, the world of continental winter sports can seem like experiencing the inside of a souvenir snow globe – a fantasy world that doesn’t have an equivalent in our own country. Shane duly abandoned his pursuit of jobs related to his chemistry studies and ventured south-east with his boyhood friend. The pair started into a pattern of working winters in the mountains and finding summer jobs such as cleaning swimming pools in Biarritz in the summer to keep them going. 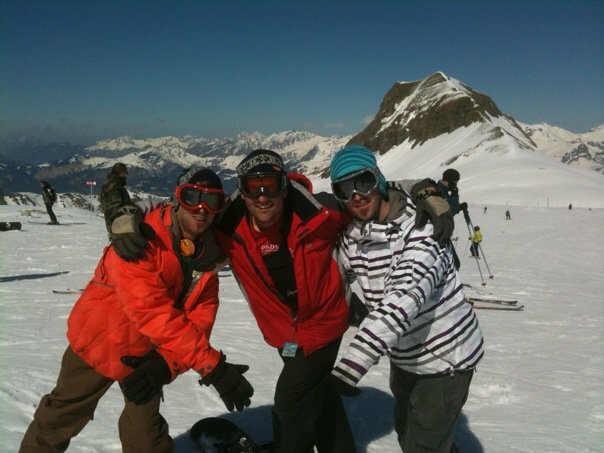 After a couple of years, they were lucky enough to get rare year-round contracts running a hostel bar in Chamonix called The Vagabond. This fortunate turn of events was to root them in the area when they were still in their early twenties. When The Vagabond was put on the market, the Mayo pair took a long serious look at buying or leasing the premises for themselves. They were to be disappointed when the owner sold it on after coming close to agreeing a leasing deal with John and Shane. 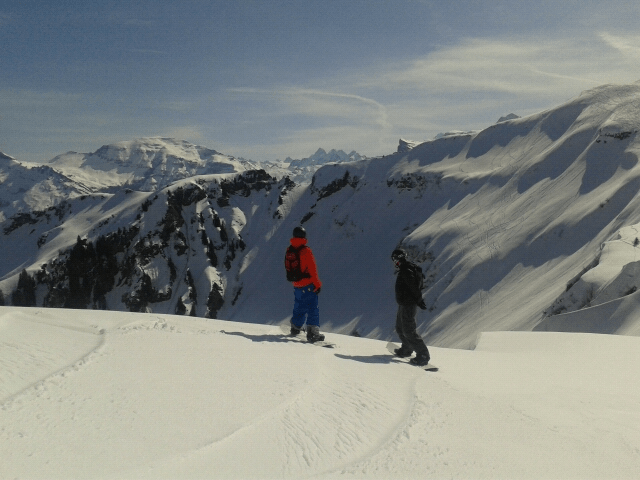 John was considering returning to Ireland at that point – perhaps settling into a pattern of working summers at home and spending winters in Chamonix. Friends of theirs, however, invited them to where they lived in the quiet village of Samoëns. Knowing that their Irish friends were harbouring the dream of owning their own pub, they just happened to introduce them to the owner of a little place in the village that they were considering selling. The money being asked for the bar was a fraction of what they had been looking at with The Vagabond. Samoëns also happened to be brimming with potential. Unlike its more illustrious neighbour Chamonix, it didn’t have a well-established ski station drawing hundreds of thousands of visitors every winter. But they both knew that a new ski-lift connecting the village to the slopes had just been built. They were young and enthusiastic and they knew about running a pub. And just as there will always be room for an Italian pizzeria in a town that needs a restaurant, there will always be room for an Irish pub in a town that needs a watering hole. Banks in France have never been a soft touch for easy credit, particularly so if the applicants are young foreigners with no established income, but the Westport men managed to gather the necessary funds from a variety of sources in Ireland and opened their doors for business in November 2003. Things have been progressing nicely ever since. Last year, they got some more luck when three commercial units came up for sale next door to the pub. Covey’s Bar was in a healthy enough financial state to be able to buy all three units, double in size and re-vamp the whole premises. It’s now, as Shane says, “a proper pub” serving food as well as drink. It’s also one of the biggest premises in the town, it’s the only foreign-owned service outlet and it’s the only pub (the others being brasseries or cafés). “We’re settled here now and we have been for the last five years or so. We always worked off a plan of giving it two to three years to see how we feel and we literally turned around after a few years here and said: ‘Things are good. This is good’ and from that point on, it became home really. Both cite the weather as a strong draw, saying that when one gets used to seeing more blue sky than grey, it’s very hard to go back to the predominantly grey Irish climate. Although France is far from being immune to the current European economic crisis, the fortunes have remained far steadier than in Ireland over the last 10 years. Back in the days of the Irish boom, there was a tendency of their friends in Mayo to persuade them to give up their seemingly nomadic lifestyle and move back and settle into a more serious and lucrative lifestyle that Ireland had to offer. When the bubble burst, however, the lads bemusedly tell how the attitude at home changed to sudden “respect” for them for holding on in France and playing it “cute”. The two of them burst out laughing at the recognition of this and the fact that they by-passed the entire boom-bust story and it never influenced their decisions in any way. As for French values, both men believe that there is less emphasis on money than there is in Ireland. They both seem to be enjoying life, but is it hard work? There are four types of pub licence in France and Shane and John have a Category 4 licence, which means that they can serve pretty much any kind of alcohol and serve food also. Opening hours are more flexible than in Ireland but they are required to close at 2am in the county where they’re based during high season and at 1am during low season. The summers, they say, can be just as busy as the winter, but with a much shorter season (six weeks instead of four months). They both love the summers in Samoëns, where the weather is usually sunny (26-27˚) and the mountains turn green. Finally, is there anything that we in Ireland can learn from the French? What can they learn from us? Covey’s Irish Pub, Bat La Cour, 74340 Samoëns, France. Office de Tourisme de Samoëns, 66 place de l’Office de tourisme, BP 42, 74340 Samoëns, France. Making me jealous! They run a fine establishment – had a good few pints in there last January. Pure gentlemen. Ditto. Wonderful time with the Sligo gang last year – all like a dream now.